At a little past noon, all the ten counter seats were already taken. There was even a customer waiting for takeout sushi. 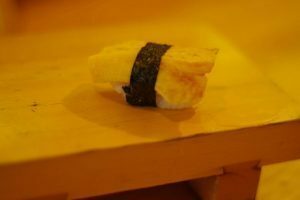 “The sushi is so good I don’t want to tell anyone about it!” said the local sushi-lovers in a breath about this sushi restaurant “Sushi Tamura.” I opened a strange door which made me doubt a little whether this was really a sushi restaurant. Then Tamura-san, the owner of the restaurant, welcomed me with a friendly smile. 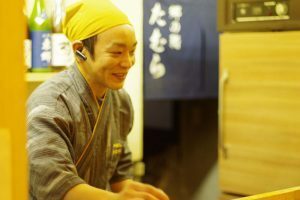 Tamura-san manages the restaurant by himself. He looks busy, but keeps smiling. 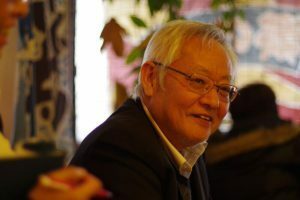 The owner who has devoted himself to Japanese cuisine goes to Mikuriya Fishing Port and Sakaiminato Port to buy fresh San-in fish by himself. He also selectively blends home-cultivated rice and the local Yago-mai rice for Sha-ri (sushi rice). The special lunchtime Nigirizushi (hand-shaped sushi) set of eight pieces of sushi costs only 1,000 yen! It even comes with a bowl of clear soup. 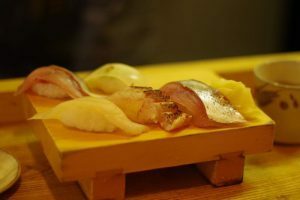 On that day, sushi toppings were Daruma-dai (Japanese butterfish), Ma-dai (red sea bream), Ma-aji (horse mackerel), Hamachi (young yellowtail), Yari-ika (spear squid), Sawara (Spanish mackerel), Shirobai (finely-striated buccinum), and Aka-namako (red sea cucumber). Sushi plates were handed over the sushi counter one after the other, and everyone was surprised to see how big and delectable these sushi toppings were. My heart pounded with expectation for the next sushi. Basically, sushi is made and eaten one by one. I restrained myself from eating to take pictures. A regular customer who came from the next town said, “It’s really delicious, so I often bring my wife and friends.” Tamura-san was listening to him over the sushi counter and said shyly, “Thank you very much for always coming.” His charming personality may be one of the reasons why this restaurant is so popular. On that day, we ordered Kaisen-don (seafood bowl, 1,000 yen) and Tamago-no-nigiri (a rolled omelet placed on hand-shaped sushi rice, 100 yen) in addition to the special Nigirizushi set. Kaisen-don surprised me by its volume and rich variety of seafood toppings. Both my stomach and heart were content with the fluffy texture and sweet aroma of freshly-made rolled omelet. The wide selection of fish on Kaisen-don are surprisingly big in size. A pretty yellow rolled omelet was fluffy and sweet. It made my day. Sushi is not the only specialty at Tamura. 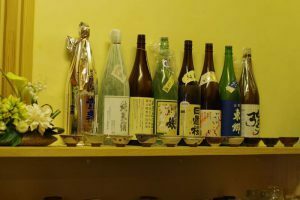 There is a variety of San-in Jizake (locally brewed sake) displayed in front of the sushi counter. Tamura offers a luxury of sipping sake and nibbling sushi at a reasonable price. 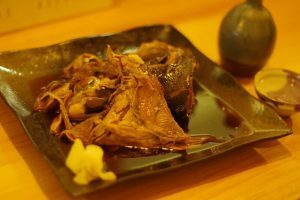 “Ara-ni” (boiled bony parts of fish, 550 yen) goes with alcohol very well. Ara-ni of Buri (yellowtail) was served on that day. First, I was very surprised to see the size. “Wow! Is this a special treat? What? This is what you normally serve for this price? !” everyone in our press team said with much excitement. We became full half way through, but thankfully we could take the rest of Ara-ni home. The fish used for Ara-ni changes depending on the fish market’s supplies of the day. I will definitely order this again next time. The taste of Ara-ni is not too rich. Upper jaw and head bones are filled with fish meat with a deep flavor. 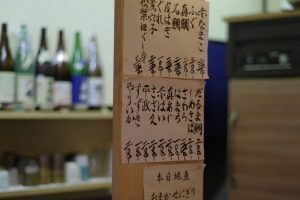 There is a variety of Jizake brewed in Tottori including the one from Kumezakura Sake Brewing Company which uses the same Yago-mai rice to brew sake as sushi rice at Tamura. You can also order Nigirizushi a la carte over the counter with ease only for 100 yen to 350 yen each. When I told Tamura-san how I thought savoring sushi at a counter only happened at exclusive sushi restaurants, he answered, “It’s great to eat sushi at a reasonable price, isn’t it? 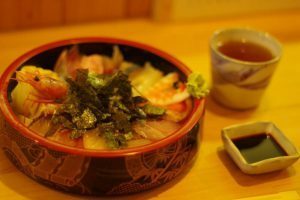 I want everyone to enjoy San-in’s fish because all the various kinds of fish here are delicious in every season.” I was at first nervous to have sushi at a counter, but my worries disappeared immediately. Every time sushi with shiny toppings come out, I get excited and relish plenty of tasty sushi. The menu changes depending on the day’s fish supplies. Tamura only uses fresh fish so it closes from time to time depending on the day’s market conditions and catches. It’s best to call in advance. I brought my baby with me on that day. 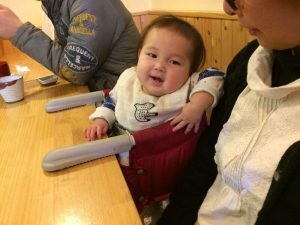 When I shared my concerns of having counter sushi, plus a baby, Tamura-san replied with a smile, “There are many customers with kids here. Please come and visit with your family again.” Since my son can’t resist sushi, I hope I can bring him here, too. There are no high chairs for kids. Tamura-san let me attach my baby’s Inglesina table chair to the counter. 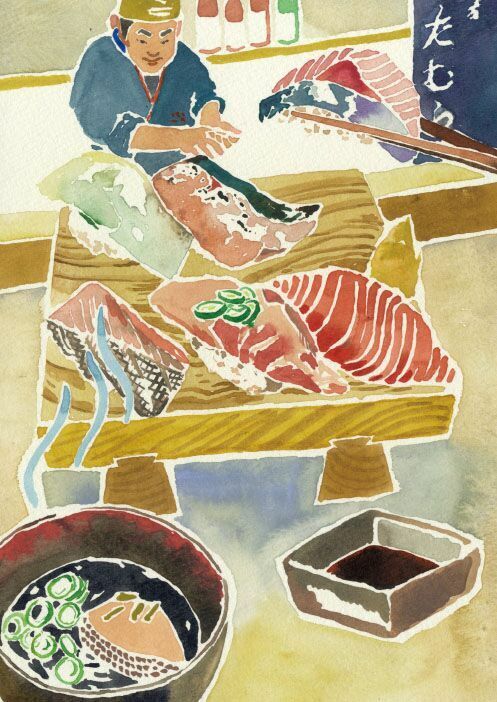 “Sushi Tamura” is where freshly-made sushi and Tamura-san’s smile sparkle. You will understand why local people don’t want to tell anybody about this restaurant.